Flooring is a noticeable aspect of any home, and choosing the right type can set you apart from the neighbors while keeping your residence comfy and family-friendly. Flooring is also one of the most popular home improvement projects, allowing homeowners to transform multiple rooms through style and function. Try Engineered Wood: Areas prone to moisture, such as the basement, are ideal candidates for engineered wood. This thick flooring contains a top layer of wood attached to multiple, thinner layers of plywood to forge a strong shield against moisture. Test Your Shade: Stains may look a certain way in the store, but that doesn’t mean they’ll turn out that way on your floors. 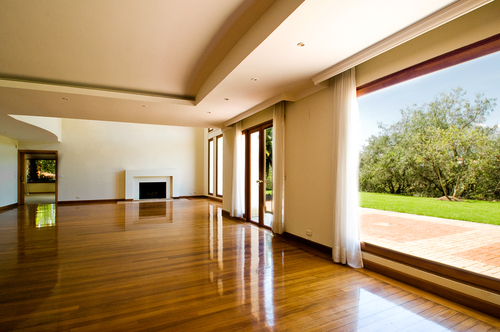 If you have wood floors, test a small piece before staining the whole surface. The same goes for carpeting—sample patches go a long way in determining how the shade will truly stand out. Pay Attention To Detail: Small touches can greatly affect the appearance of your flooring, and all you need is a few key building supplies to get the job done right. Whether it’s a carpeted living room or a tiled kitchen, trim and molding in complementary shades demonstrate pride your home’s appearance. Protect Your Flooring: Since flooring receives a lot of foot traffic, it’s important to keep it protected. A stylish area rug adds an extra layer of protection over any surface, while wood floors benefit from a protective finish. Stick To Your Style: Home improvement projects come in all shapes and sizes, and additions will add appeal to your home. Traditional homes benefit from classic wood banisters and molding, while modern homes shine through accent tables, area rugs, and pops of vibrant color. Whatever your style is, stick to it to create a one-of-a-kind abode that’s stylistically cohesive. With free estimates to help plan your project well in advance, Bargain Outlet is your one-stop shop for everything renovation-related. Visit their website to learn more about flooring options and find the location nearest you!